The third volume of this acclaimed series offers a sobering look back at the history-making events of 1974. Often humorous, sometimes poignant, and always interesting, these cartoons are guaranteed to tickle your funny bone and tug at your heartstrings as you turn the pages. The people, events, and issues that made headlines in 1975, including the Ford administration, the CIA and FBI, Indira Ghandi, gun control, New York City’s financial plight, presidential hopefuls, and the energy crisis. Paperback. This volume highlights such newsworthy events as the presidential election, the Bicentennial celebration, the Olympics in Montreal, the Wayne Hays scandal, swine flu, and the energy crisis. Paperback. Combine the wit and insight of more than 130 leading editorial cartoonists from the United States, Canada, and Latin America with the headline-making events of a year filled with controversial issues, and the result is this provocative volume of prickly satire and social commentary. Paperback. 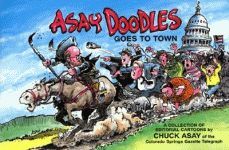 Combine the wit and insight of 130 leading editorial cartoonists with the headline-making events of a year filled with controversial issues, and the result is this provocative volume of wry satire and social commentary. Paperback. The 1980 edition of the Best Editorial Cartoons of the Year Series, which has been banned by government authorities at the 1979 Moscow international Book Fair, contains the best works of some 130 leading editorial cartoonists from the United States and Canada and focuses on the 25 major news stories of the year. Paperback. The ninth edition of Best Editorial Cartoons of the Year follows the same successful format as the previous volumes. Each book not only entertainingly encapsulates the year’s history-making events as they happened, but also records for posterity the opinions they generated. First published in 1972, the annual series has been widely acclaimed as a concise yet far-ranging pictorial history of each year’s events. The 1982 edition contains more than 360 editorial cartoons reflecting the best efforts of 141 cartoonists, along with an illuminating foreword by Pulitzer Prize-winning cartoonist Mike Peters. He discusses how a cartoonist conceives the ideas for his daily work. Paperback. The Best Editorial Cartoons Of The Year - 1983 Edition continues the standard of excellence established in previous editions. More than 350 editorial cartoons reflect the best work of 140 cartoonists who focused their sights on the Middle East, Poland, Latin American, Great Britain, Pope John Paul II, the economy, and an array of other issues that made the headlines in 1982. Paperback. What do the Regan administration, the U.S. Budget, National Defense, the Soviet Pipeline, and the Pro-Football Strike all have in common? They’re all subjects that were up for grabs in 1982 for the nation’s leading editorial cartoonists. Paperback. Published annually since 1973, Best Editorial Cartoons of the Year zeroes in on the past year’s headline-making events. From the presidential election at home to the tragedy of hunger in Africa, 1984 is captured in more than 300 cartoons from 131 leading editorial cartoonists. Paperback. Relive the year’s history-making events with Best Editorial Cartoons of the Year, 1986 Edition. Since 1973, this series has showcased the talents of leading editorial cartoonists form the United States and Canada. This year’s volume presents more than 350 noteworthy cartoons from 133 cartoonists, including the top prize-winners of 1985. The 1987 edition focuses on the year’s most newsworthy issues, including the following: the Iran-contra arms scandal; the Chernobyl nuclear power plant disaster; the Iceland summit and arms control; the war on drugs and mandatory drug testing; the Achille Lauro and other hostage crises; spy networks both national and international; and much more. Paperback. The demise of Democrat presidential hopeful Gary Hart’s campaign, the defrocking of Jim Bakker as leader of the PTL, and Iran-Contra. Paperback. The year 1988 was a bonanza fro cartoonists. The long presidential campaign led the news, culminating in the struggle between George Bush and Michael Dukakis for the White House. But that was not the only news. Includes the Middle East conflict, a multitude of airline crashes, the war on drugs, political milestones in the Eastern bloc, and Batmania. Paperback.